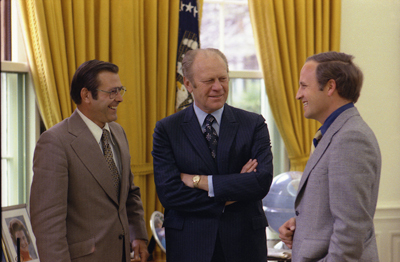 Description: President Ford chats with Chief of Staff Donald Rumsfeld and Rumsfeld’s assistant Richard Cheney. Rights Information: Public Domain (No usage fees, no permission required). Attention Publishers and Media: Please print out this page and retain for your permissions records before downloading this image for possible publication. The Library staff cannot sign permission forms or provide additional paperwork. The Library charges no usage fees for its images.